Credit: By Don McCullough on Flickr. Some rights reserved. The ability to fly cameras and capture the world from above using drones has sparked the interest of news outlets who have seen great opportunities for journalism for a number of years now. Examples of photos taken with drones – which enable the viewer to appreciate, perhaps, the size of an area of land, or the impact of a natural disaster, or a video which takes the viewer on a journey through spaces which would be impossible for larger craft – help illustrate how this technology can be harnessed in journalism. But along with those opportunities there are many issues, such as in the areas of rights, regulations and safety, which news outlets are having to get to grips with. In a series of presentations at the Global Editors Network yesterday (19 June) these issues were covered by those working in the area of drones at news outlets including the BBC and Australian broadcaster ABC. First, research director at Oxford University's Reuters Institute, Robert Picard, highlighted some of the key issues in this field, as were raised earlier this month in its Remotely Piloted Aircraft Systems and Journalism report. One of the key issues raised by Picard, and others, was the need for those working with drones to have an understanding of aviation regulations. "Anything that goes into the air, comes under the jurisdiction of aviation regulators," Picard warned. He said the concerns would be about any dangers caused by operation of drones. For example, he asked, "what happens if someone flies a drone into the air space of aircraft landing in an airport?" "Most media lawyers know absolutely nothing about aviation law," he added. In Australia, ABC's senior editor Mark Corcoran has spent this year working on a project looking into the journalism potential with drones. He said the possibility of a "system where the smallest drones could effectively be de-regulated", is being considered in Australia. But until more direction is given on this, he said ABC is not yet investing in its own drones and training. "We don't know where this is going to end up," he said. "The way I see it, there's not much point in the ABC investing heavily in training and certification when the goal posts may be moved or in some cases pulled down altogether." BBC News live editor Guy Pelham highlighted the issue of disparity in the rules from one country to another. "If I'm in the UK and I'm operating one of these systems, I have to abide by a set of guidelines," he said. "Do I keep those set of principles when I go to the developing world where there isn't any regulatory regime?" He asked whether there might be "at least scope for a coherent regime across Europe" on this area. There are a number of legal issues to bear in mind, such as data protection if a drone is collecting data while in use, Picard said. Operators of drones also need to consider how close they are allowed to get to people. If the limits mean keeping a significant distance, this may mean the use of such technology may not serve its purpose for covering certain news events from the air, he said. 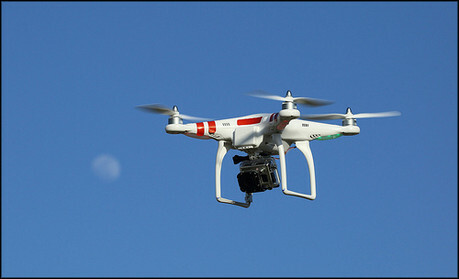 Privacy is another area of the debate around drones, such as the problems if operating drones in areas where people have a right to privacy. These points are "real issues", Picard said, that news outlets need to "start thinking about" if wanting to work in this area. On the subject of security, such as when operating drones in areas of conflict, their use can be a double-edged sword, Picard warned. While, on the one hand, being able to remotely control a drone to capture footage offers additional safety for a journalist, there may be a risk of "putting out a radio signal that can be honed in upon" by those interested in targeting journalists, he said. Live editor for BBC News Guy Pelham also highlighted the potential risk to the news outlet's reputation. Firstly, in terms of the perception of some that they are being spied on. "They don't like it", he warned. Secondly, the damage that can be caused when things go wrong, and a drone, or UAS/UAV (unmanned aerial system/unmanned aerial vehicle) as the BBC refers to them, crashes. One issue raised by the session was the training necessary when journalists start to use, and pilot, drones. This was highlighted by one participant in a drone journalism experiment carried out by L'Express with Parrot, Hacks/Hackers and Vyclone. BBC's Pelham warned about the risk of journalists getting caught up in the piloting and running of drones, and losing their focus on their "news gathering" role. The BBC tackles this by hiring in experts, so that "journalists get on with the main job of gathering the facts". Another issue related to the piloting of drones, is where this is done with "first person view", meaning the person operating it can only see the view of the camera, which ABC's Corcoran warned offers a "limited field of vision". The end quality of the footage is also an issue which needs to be addressed, vice president for CNN International Digital Peter Bale added during a following panel discussion. Gary Kebbel, a professor at the college of journalism and mass communications at the University of Nebraska-Lincoln, later added that viewers are usually more "forgiving of quality" when it comes to immediate breaking news coverage. So, he added, one approach could be for a news outlet's "first response" to be in the form of a drone, with the organisation's video journalists following up with later reporting using more traditional methods. While the speakers highlighted the potential for drone journalism, and made no question of its likely impact, they were clear to raise the serious legal, ethical and safety considerations that the industry needs to understand and follow. And overall, the speakers also stressed the fact that, much like many other new technologies, the potential of the drone is as an additional tool for journalists, rather than to replace any other. Concoran said his interest in the area of drone journalism is to answer the questions of whether it will be possible to "reduce our exposure to risk while enhancing our coverage of stories". He said while this "won't replace the journalist on the ground", there are a number of examples which have shown how applications of this technology "could have a major increase in safety." Pelham added that they are "one more tool in the range of equipment we have available to tell a story".